The Last Issue Of Hawkeye Is Finally Coming Out! Really! 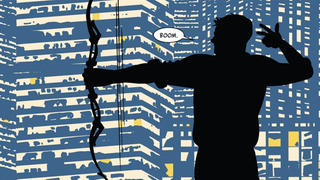 Fans of Matt Fraction and David Aja’s Hawkeye series will be more than familiar with the long story of Hawkeye #22. The final issue of the run, which was first supposed to come out in February after a three-month delay on Hawkeye #21, has failed to materialise repeatedly. Until now. There’s a preview and everything! Isn’t it cute that they actually think this is coming out? I know, right! Giving it a release date! But Marvel is serious this time, apparently more serious than the past three or four times they’ve given Hawkeye #22 a release date. We may never know the real story behind what happened to Hawkeye #22 — a comic literally so late its titular hero gave up waiting for it to end and started a new series — but at last, the excellent, Eisner-award-winning adventures of Clint Barton, Kate Bishop, and Lucky the Pizza Dog are coming to and end, and we can’t wait to see how it all pans out. Hawkeye #22 is due for release on July 15th. Maybe. Fingers crossed?